As baking has now been a part of my "not so boring" life (lol), I am thinking of ways to speed up my work and make everything organized. I'have thrown several messed up recipe sheets as I accidentally spilled something on these while baking. Holding these sheets with my dirty hands also made the recipes unfit for future use. Because of this experience, I have thought of coming up with something to solve my problem. 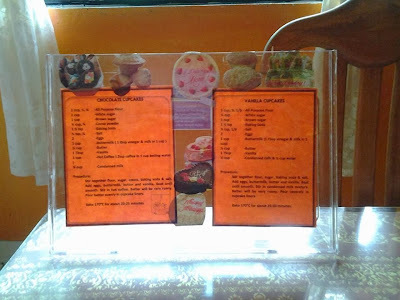 You see, I always wanted to display the recipe sheet every time I bake as I don't want to miss up on any ingredient. It happens to me once and this affects the overall taste of my cup cakes. On one of my shopping adventures, I chanced upon this plastic holder which is actually multi purpose. It's good to hold photos, menus, brochures, directions, announcements, etc. Oh, and I find it perfect as a recipe holder for my kitchen, at least just for my cake recipes. 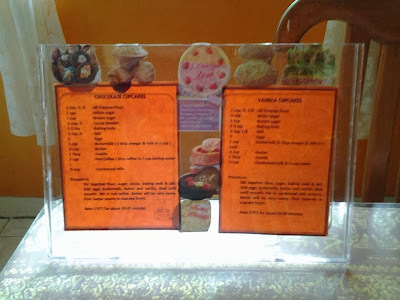 As there are two basic recipes which I often used at home for our cup cake business, I thought of having these recipes displayed on this recipe board. It's so easy actually. I just have the recipes printed from the computer, cut these out according to the size of the plastic holder, add up some cute photos of cakes from my old organizers and magazines and voila! I have this very cute recipe holder for my favorite cake recipes. This holds my recipes permanently and protect them from being messed up while baking. Also, it is very convenient for me to scroll down the ingredients as the recipe is displayed in a standing position.